Which Electric Wheelchair Ramps are for Vans? 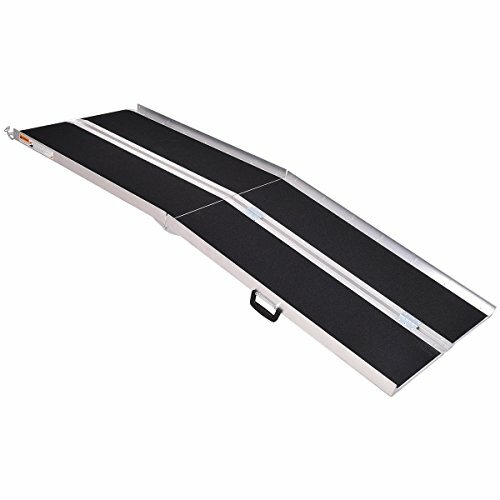 Where Can I Get Portable Wheelchair Ramps for Vans? 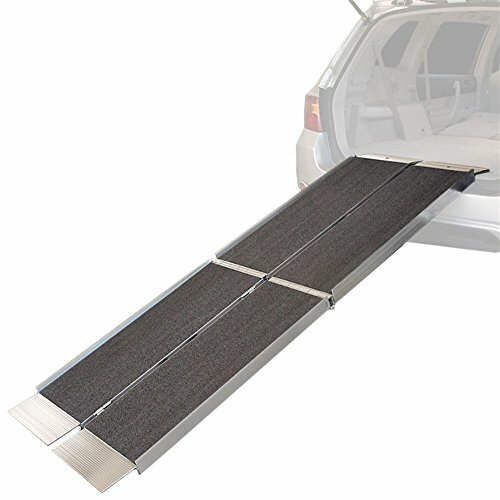 What Folding Wheelchair Ramps for Vans are There? Wheelchair ramps for vans are an increasingly popular mobility option. Finding the best wheelchair ramp for a van requires an understanding of what is out there in terms of mobility equipment and what is the right match for your needs. There are many wheelchair ramp options on the market with features and capabilities that can make getting around a breeze. However, the amount of information and lingo can be overwhelming. That’s why you want to take the time to read through definitions and research the options to find the best fit. Mobility is important to those in wheelchairs, and the best ramp option will be able to enhance your life. A ramp is an investment to allow for easy conversion of a van to improve accessibility. 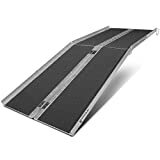 With these ramps for wheelchairs reviews, you’ll be able to find the right one to fit your needs, lifestyle, and budget. This ramp lives up to its promise of being portable by weighing in at just twenty pounds. It is made of aluminum and easily folds in half to be transported like a suitcase. It has optimal strength, and the ramp surface area is covered in anti-slip material to help with the traction of various types of wheelchair wheels. The ramp is 30 inches in width. It can work with a variety of wheelchairs or motorized wheelchairs. For safety, it has an instruction video and safety pins as well as a 3X Safety Factor. It is reported to have a maximum capacity of 800 pounds. Why We Liked It – Anti-slip traction and fabrication means this portable ramp will be good in all kinds of weather, slippery tires or not. The lightweight aluminum design also keeps the promise of portability. The Titan ramp is a force to be reckoned. 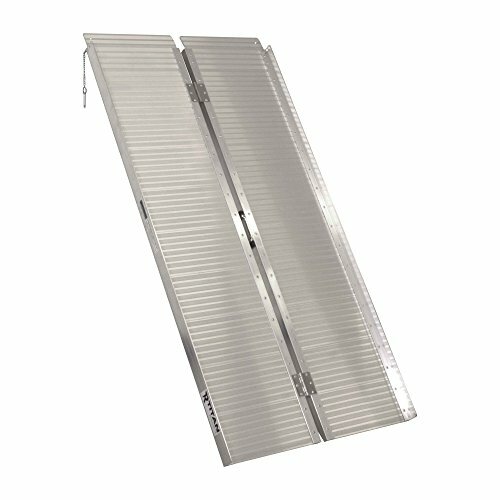 This aluminum ramp proves great for loading onto curbs, sidewalks, and even steps from a mini-van. It is 30 inches wide and 60 inches long with a 2.5” angled lip to help secure the ramp. The briefcase folding design allows for portability of this 30-pound ramp. It also features soft nylon handles for easy carrying. The serrated surface is helpful in slipping prevention in all situations. The portability allows it to swap between side- and rear-entry as needed and not obstruct van access for others. Why We Liked It – The briefcase fold accompanied by handles for portability helps make this ramp flexible and convenient. The serrated surface is perfect to decrease slipping hazards and increase safety during ramp use. More is better in the case of the GoPlus Multi-Fold Aluminum Ramp and the two size options available for it. Choose between the 5×30 or the 3×30 to find the fit for you. The ramp is designed for steps, curbs, and sidewalks. When you are done using it, just fold and grab the carrying handle to go on your way. The surface of the ramp is great for optimal hold in all weather conditions. It features a solid traction surface. The aluminum design is sturdy and able to hold up to 600 pounds. The construction is also water-proof, ensuring the longevity of the product. + Great for sidewalks, curbs, etc. Why We Liked It – The portability of this ramp and the high traction make this a great choice. Even outside of a van situation, the GoPlus could help in navigating stairs, curbs, and more. The unique three-fold design allows the EZ-Access Trifold to be lengthy but still portable. It breaks into two sections for carrying, storage, and use. The interlocking hinge creates reduced pinch points and smooth operation. It also delivers safety with a high-quality, slip-resistant surface. The aluminum is welded aircraft-grade that can handle up to 800 pounds and has a lifetime warranty. The slip-resistant surface is accompanied by a self-adjusting bottom to help make entry and exit that much easier. It does weigh in rather heavy at 60 pounds, making this a great semi-permanent solution. It unfolds to a 29.5-inch surface width. Why We Liked It – The EZ-ACCESS ramp easily separates into two halves, each with their own handle. Add high-grade aluminum and six-month financing options and it is clear why this is so popular. Rage brings all the options with several options for wheelchair ramp length and angles. A popular one is the 5-foot long ramp with a 10-inch rise. These ramps are designed for curbs, steps, and other raised surfaces. Like a lot of wheelchair and mobility scooter ramps on this list, it also has a compact fold with built-in handles and a non-slip surface. The aluminum design is rust-proof and holds up to 600 pounds. The ramp is just under 15 pounds, giving a super lightweight option. With the easy fold and carrying handle, this is a great option for the frequent traveler. Why We Liked It – Rust-proof is worry-proof as ramps are exposed to varying conditions. This one also has a lot of heights and lengths available, ensuring there is something for every need. This ramp is useful for both occupied and unoccupied loading and unloading. It has an 800-pound weight capacity. It does come with a great extended lip design that helps it to clear the bumper in the vehicle rear. The ramp has a width of 30 inches of platform space. To accommodate different uses, the rise is adjustable. For unoccupied loading/unloading, it has a max rise of 18 inches. Occupied loading/unloading is 6 to 12-inch rise. It folds easily into about a quarter of the fully opened size and even separates into two sections for easy carrying. Why We Liked It – The extended lip design and 18-inch rise literally make this option stand out from the crowd. The extended lip design helps to avoid scratches and bumps while loading in/out. This second Titan model on the list doesn’t disappoint. It offers 7 feet of loading space and a multifold design, folding down to 46” x 15” x 8” versus the full size of 84” x 30”. The 2.5” angled lip has holes to help secure the ramp in place prior to use. It is capable of holding up to 600 pounds on its slip-resistant surface. The company recommends using this with wheelchairs and scooters, but not with assistance walking alone. If the sole intended use of the ramp is for wheelchairs or electric scooters, this is a solid choice. Why We Liked – This is one of the longer ramps on the list with an angled approach to allow for easy loading. The multi-fold design makes up for length with the ability to fold significantly. This EZ-ACCESS lives up to its name and even adds in a self-adjusting bottom for increased security and simplicity. There are three lengths available with the heaviest weighing in at just 18 pounds. It has a suitcase style fold to fold in half lengthwise when not in use. This ramp increases accessibility in a variety of situations, not just for van loading or unloading. The brand also offers an emphasis on helping customers regain confidence and freedom through product use. Depending on the situation at hand, this is a solid semi-permanent or even permanent solution to mobility needs. Why We Liked It – Aside from a positive company culture with EZ-ACCESS, this wheelchair ramp for vans also offers the self-adjusting bottom. That feature highlights and exemplifies the safety of this ramp for potential consumers. This GoPlus is great as a wheelchair ramp for a minivan, side or rear entry. It has an easy fold design for storage and portability. It comes in two sizes, seven or eight feet. The surface is coated in a traction-able material to allow for use in all weather conditions. 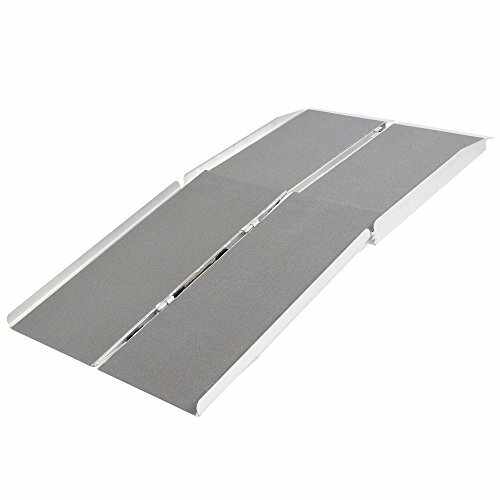 The ramp is aluminum and has a 2.5-inch angled lip to help secure it in place prior to use. Additionally, the ramp adjusts to surface elevations up to 16” for wheelchair users. The adjustable height allows this to be used as more than just a wheelchair ramp for a minivan. 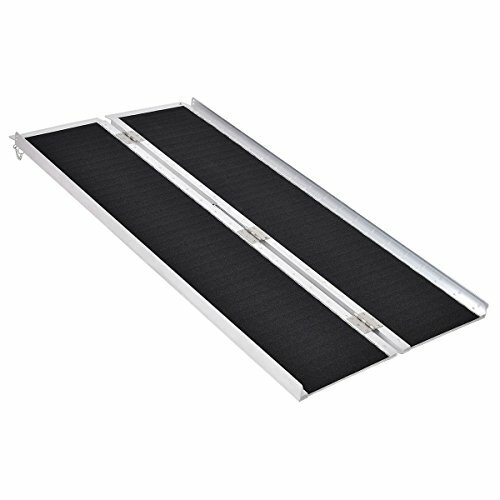 Why We Liked It – Overall, this is one of the great portable wheelchair ramps for a van. 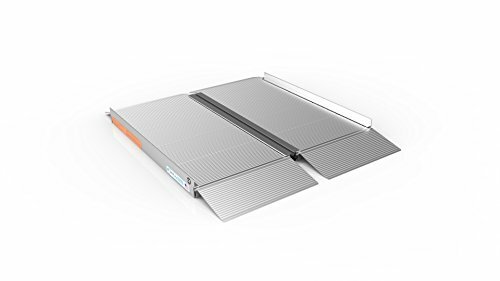 It has all the hallmarks of a safe ramp, including maximum capacity, a high-traction surface, and a portable design. 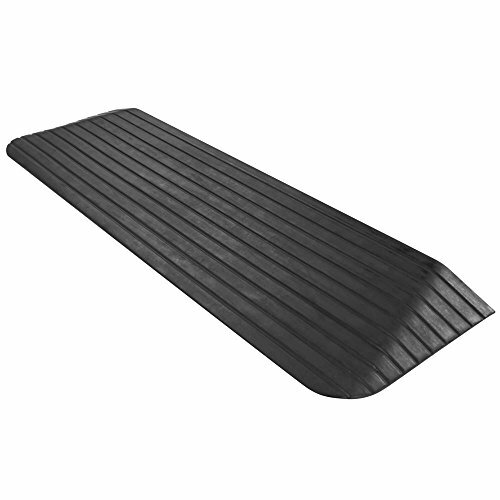 Aside from traditional aluminum, rubber ramps are becoming more common these days. The beveled edges allow for a smooth approach for surfaces up to a 1.5-inch rise. It is a one-piece design that is 16 pounds. It is not ideal for minivans, but good for entryways to homes. The rubber construction ensures years of use and is made of 100% recycled rubber – so it’s environmentally friendly! The surface is also slip-resistant and has molded drain channels. This allows water to fall away and not obstruct usage of the threshold ramp. The ramp also has a great finished design and appearance. Why We Liked It – While this might not be a great choice as a wheelchair van ramp, it is perfect for thresholds and smooth entry into homes. The clean-cut appearance will look sleek around the home. As indicated through the product reviews, there are a lot of options and considerations to make before committing to a van ramp. Let’s look at those differences and dive into what to know before you buy. Converting the van is always an option but tends to be a more significant investment. 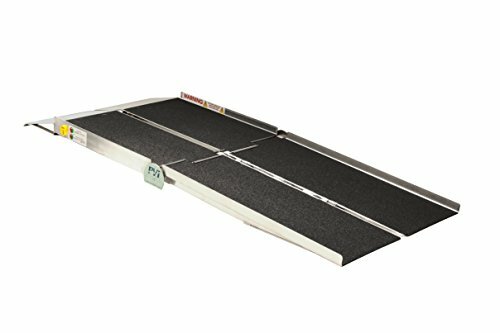 The ramps here are more flexible in use and can even help when tackling curbs, stairs, or entryways during travel. Most ramps are made of aluminum, which typically makes them lightweight and more portable or easier to store. The surface might be all aluminum or feature non-slip materials, like a rubber design. All ramps will promise slip-resistant surfaces, but the truth is in the material. This is important when deciding ramp dimensions and angle. Side or rear entry will impact parking options, taking into consideration the need to set up the ramp. Using a wheelchair van side door ramp allows for curbside entry and exit that will typically be away from traffic. 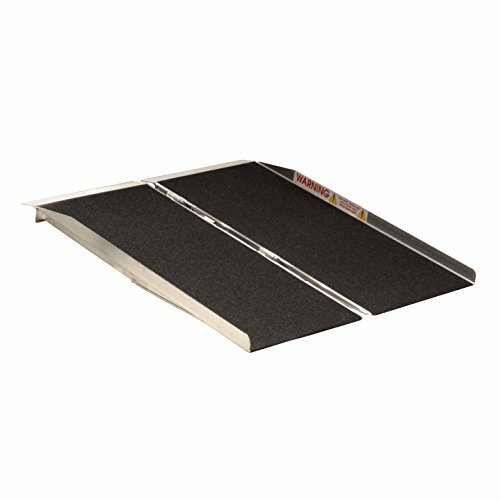 These ramps leave space for maneuverability and don’t deter from rear storage. Rear entry ramps look different but allow for parking in any space. There’s more space for ground clearance, influencing the angle of the ramp. The great thing about the ramps here is that they are portable, allowing for an easy swap between side or rear entry. As shown in these product reviews, there are a lot of lengths available to choose from. Choosing the right one requires a little previous homework. The vertical rise of the van has to be measured by measuring the height from the ground to the loading surface (typically the part of the van the ramp will be used on). Use that height when reading up on the rise listed for the ramp. The rise plus the length of the ramp will give an idea of how steep the ramp is going to end up being. Most of the options here are portable or folding van ramps. There are also rubber threshold ramps and more utilitarian ramps. For the best wheelchair ramps for vans, folding and portable are typically the route people take. A folding and portable ramp is a semi-permanent or permanent solution to those seeking a van wheelchair ramp. Whether electric or a more traditional wheelchair, most of the ramps here are also great electric wheelchairs ramps for vans. The difference is considering the maximum capacity as most electric wheelchairs weigh significantly more than a traditional wheelchair. There are a lot of brands and carrier trailers when it comes to mobility ramps for vans. 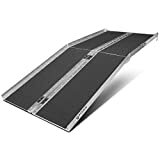 Buying from the manufacturer is always an option but portable wheelchair ramps for vans can also be found from well-known vendors like Amazon. If looking for a more permanent or high-tech solution, consider van conversion. The first evidence of a wheelchair use comes from an engraved image in China circa AD 525. Centuries later, King Phillip II of Spain used a chair designed specifically for mobility. Sound familiar? A wheelchair ramp isn’t just a tool for travel. It is a way to freedom and confidence for those seeking a handicap van ramp or needing to increase mobility. Being able to access a vehicle with ease grants a level of mobility and freedom not previously experienced. There are so many great ramps for vans that it is just a matter of finding the right fit for your needs.